--To not care that a member of One Direction left. Why is this news all over the place? --To be going to the Club on base for Easter Brunch. There's champagne. --To have taken the kids to see Cinderella. It was a good movie! --To be bummed that the next season of Downton Abbey will be the last. But then again, how much more crap could happen to the family? --To be making a ham for Easter dinner. But a small ham, since Tom isn't here. --To have a prize package giveaway that includes a Downton Abbey book here. --To have given up on decorating my husband's birthday package. I wanted to have wrapping paper on the flaps, but the tape began sticking everywhere and going on everything. I cursed and gave up. Decorating boxes is not for me. My husband says he's perfectly happy with plain ones, which is good, because that's what he gets 95% of the time. looks like a great package for Tom! I didn't really enjoy this season of Downton, it's gotten more boring as time goes by. I'm sad about Downton ending too. But, there's always Call the Midwife! If I hear about One Direction one more time I'm going to lose it! Ooh champagne!! And I love the care package/bday gift. He's going to be excited. going to see cinderella next week most likely. i can't wait! agreed about one direction. enjoy your easter meals. i'm sure your husband will love the package! I saw that people wanted compassionate leave because they were so upset about the guy leaving. I can't even. Sounds like a great care package! One Direction who?! Haha just kidding but not really. Always say Yes to Champagne! ;) I am sure he is just excited to get what's in the package not how it's decorated. Jordan said that girls in his advisory (home room/study hall) were crying about the person leaving One Direction - high school girls - crazy!!! Sounds like Tom is getting a pretty great birthday package! I didn't know one of the members of one direction left. So glad my teen and preteen aren't into them. I wanted to see Cinderella but as with all movies I want to see, I just didn't get around to it. My girls saw it and loved it. I am the worst gift wrapper ever. Boxes? Forget it. Happy birthday to Tom! You're a pretty awesome wife for even considering decorating the birthday package. I wouldn't have thought of that, and it's the thought that counts right? Happy almost Easter! I saw Cinderella last week and I love it! I have mixed feelings about Downton Abbey. But I agree, I'm not sure how much more you can throw at that family. Lol. I am sooo sad about Downton. I love it so much! The one direction news baffled me too. Who cares? Who's zayne? Why name their kid that? I don't even really know what One Direction is. 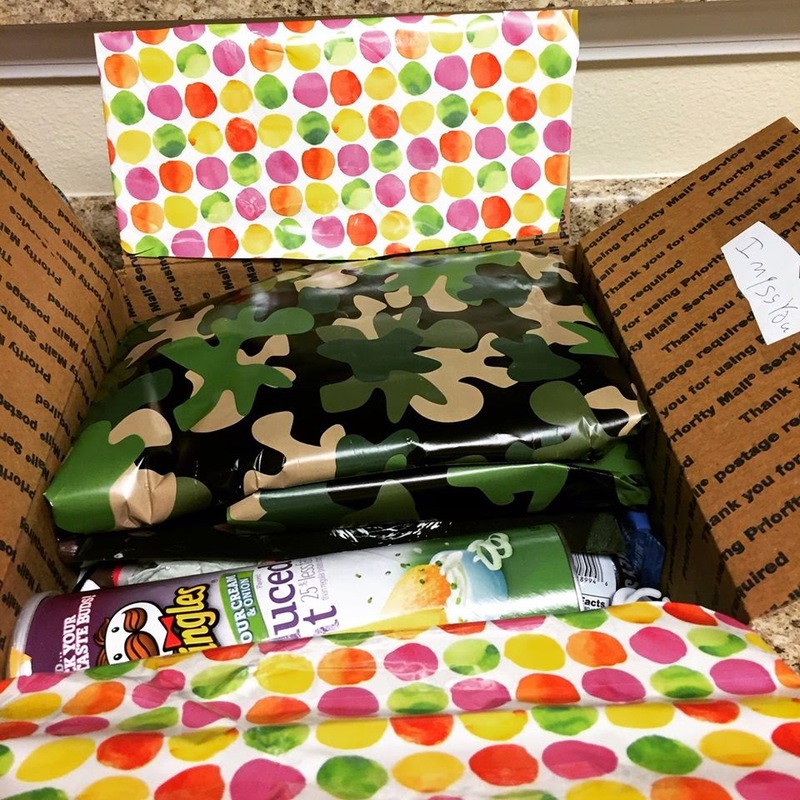 I do know your care packages rock! Bands break up/members leave all the time...I don't get the mass hysteria. You wrapped the gifts in the package, so that counts for something! Enjoy your Easter brunch (and Champagne)!! Really why is it news that the guy left One Direction haha. I didn't even know who it was that left the only one I knew was Taylor Swifts ex.